Bobbie Houston and her husband Brian Houston are Global Senior Pastors of Hillsong Church, a church they started over thirty years ago in Sydney, Australia. Born in New Zealand, both Bobbie and Brian are Kiwis by birth. Though she was christened in the Anglican Church, Bobbie didn’t grow up regularly attending church. But at the age of 15, she walked into the Auckland Town Hall in New Zealand and sensed the presence of God, and her life has never been the same since then. She was 16 and Brian was 19 when they met. He was her only boyfriend and she married him, and today the two have 3 grown children, and 7 grandchildren. In 1978 Bobbie and Brian moved to Australia to help his father with his church. But by 1983, they started their own church, known today as Hillsong Church, with locations on 6 of the 7 continents. The church is well known around the world for its conferences, teaching, and worship music. Bobbie loves the church and she never dreamt that Hillsong would have the large impact that it has in the world; but she’s humbly grateful and uses every opportunity God is giving her through Hillsong to spread the name of Jesus. She is passionate about seeing all people find Jesus as their Savior, gain a revelation of their value in Him, and rise up to make a stand for justice on the earth. 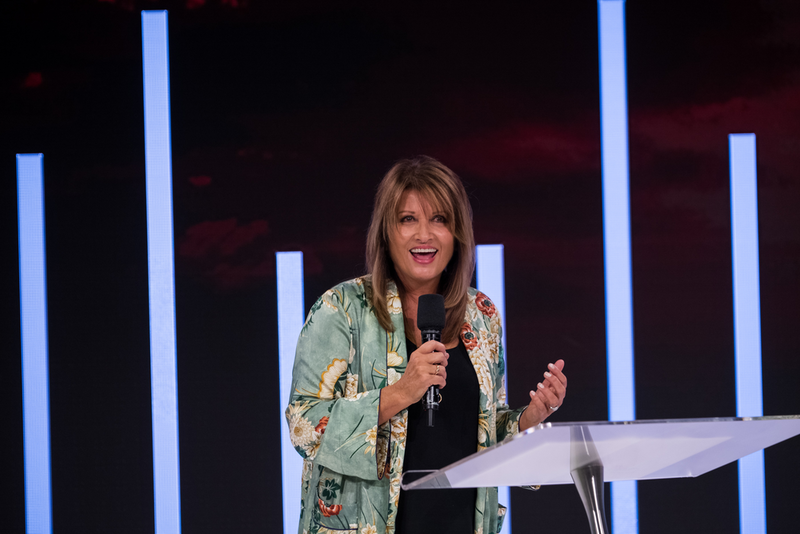 In addition to all the roles that Bobbie has within Hillsong, she’s also raising up a strong and capable company of women through Hillsong Sisterhood, the global Colour Sisterhood, and the flourishing annual Colour Conferences that take place across five nations. Enjoy the first interview of 2018 with Bobbie Houston: wife, mother, grandmother, sister, friend, pastor, influencer and visionary. Seele Magazine: How do you manage to stay looking so young at the age of 60, being a wife, mother of 3, grandmother of 7, leading Hillsong from the top, and all the other responsibilities that you have? Bobbie Houston: Well that’s a lovely compliment. I don’t really know the answer, except to say that perhaps when you are consumed with what you love, it shows. The pace is real, and it’s felt at times physically, but we’ve learnt to recoup quickly. And He does grace you for what you are called to. SM: Did you have a sense of destiny from a young age that you would be on a global stage co-leading a church and inspiring people? BH: No, I didn’t. I came to Christ at 15 and threw myself into church life and loving Jesus. I think I volunteered the first week at youth and the rest is history that simply unfolded. I am an avid believer in being faithful with what is in your hand- then that will lead you (faithfully) into whatever God has for you. SM: What would you tell your 16-year-old self, your 25-year-old self, and your 40-year-old self? SM: How do you manage to make each person that comes into your presence feel like they are the only person in the room? BH: Oh. I hope that is true and that I do that. I think when you realize that it isn’t about you - as in your own insecurities or whatever - your focus turns genuinely towards others. In conversation, learn to ask questions of the person you are speaking with. Lots of questions. SM: What steps do you take when dealing with life's challenges, especially when you have a public / church leadership role to fulfill? BH: I try to perceive what is truly behind the challenge. Perceive that and you will know how to respond and pray. SM: How do you stay humble as God grows your stature and influence around the world? BH: In all honesty we have no delusions of grandeur on that note. Everything is according to his grace and purpose. We’ve learned to work hard, steward that grace and opportunity, and protect it but again, we honestly do recognize that without God, we wouldn’t have what we have, or be doing what we are doing. SM: To people that feel they have a great sense of destiny, but are still quite young, what is your advice for them so that they don't get ahead of themselves to trust God's timing? BH: Get planted in a good church. Be faithful. Willing. Teachable. Gracious. Pure hearted. Honouring. And the Lord will take care of the rest. SM: For the month of November, Seele did a series titled, On Trial, asking the question: "if you were on trial for being a Christian, would there be enough evidence to convict you?" What evidence should be showing in the life of a follower of Christ? BH: Oh goodness. I hope so. I think so. I’ve loved the Lord unashamedly for over 45 years. I guess the defining quality of a true follower is that sense of “uncompromising devotion.” In the Amplified Bible translation it speaks of the righteous as “the uncompromisingly righteous.” I would like heaven to think that of me. SM: As you stay the path that God has called you to, what will you be focusing on in 2018? BH: The Colour Conference consumes a huge part of my year. From pondering and planning to the outworking of it around the world. So my focus is to give it my best and to find the heart of heaven for the women for this coming year and season. Big picture for Brian and I and Hillsong Church, our vision doesn’t change. It just continues to develop and mature. BH: My Lord! And “the Savior” this world so desperately needs.